For some reason I seem to be on a non-fiction kick lately. 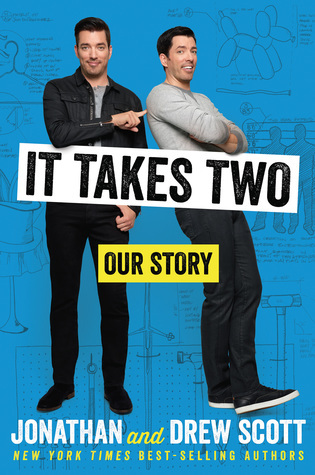 To continue this trend I chose It Takes Two: Our Story by the Scott brothers. 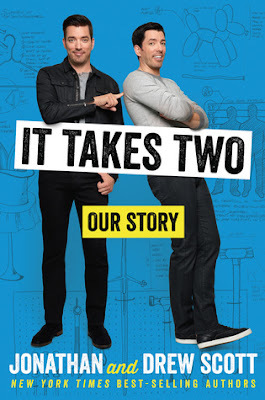 It came up on sale on Audible the other day and I like Property Brothers and Brother VS. Brother, plus I enjoy a quick memoir if it's not too salacious. This was exactly the kind of memoir you would expect from Drew and Jonathan. Their lives are so intertwined that it should come as no surprise that their prose is the same way. They take turns narrating each chapter with comments from the non-narrating brother inserted. It is very organic and feels like they are chatting with you rather than reading a book. This is not a book about Hollywood shenanigans and sexual romps. It's the story of two hard-working brothers who come from a loving family and have a hefty work ethic. Assuming they're not blowing smoke, their private lives seem to line up perfectly with their image onscreen. I admire the fact that they didn't dish any dirt or tell tales out of school. Even when Jonathan talked about his divorce (I think it's Jonathan who got divorced, it's hard to keep them straight even here) he was respectful and kind about his ex-wife. It's hard to trust anyone in entertainment with all of the current scandals involving people I used to admire, but it sounds like the brothers are genuinely nice guys who care about their family and friends and try to do their best in everything they do. I remember reading a criticism about them and their shows, saying that the twins are never there actually doing any work. After reading this, I understand why that might be true. They are beyond overbooked and it's amazing they get anything done. I just hope they get to slow down and enjoy their success at some point. It seems like they deserve it. Four stars for a solid, entertaining read.